overnight trips to the islands for both diving and snorkelling as well as island exploration. Certified divers should remember that it’s essential to carry your certification card with you or you will not be able to dive (other than as a beginner, with an instructor). It’s necessary to carry your log book as well. Bareboat means ‘You are the skipper, your friends the crew’, but these boats are anything but ‘bare’, usually being very well equipped. Both power boats and sail boats with auxiliary engines are available, ranging in length from about 7 metres (containing 4 berths) up to 15 metres (10 berths). As a rule of thumb, for maximum comfort, the crew should number two fewer than the maximum number of berths on the yacht. Bareboat charter bookings are best made directly with the charter company but in some cases may be made through a travel agent. A deposit is required at the time of booking, which is held until the completion of the charter. The balance of the charter fee is usually payable 60 days before the charter begins. Travel insurance is recommended in case it is necessary to cancel. How much experience is necessary? Prospective charterers need no formal qualifications. For your own peace of mind someone in the crew should have some experience handling a boat. The crew is given a briefing and checkout aboard the yacht before setting off, at which time the skipper will need to demonstrate that he or she can handle the vessel. The charter company may request that a professional skipper go along for a day or two (at the charterer’s expense) if there is doubt about the competence of the skipper and crew. Charters are measured in nights aboard the vessel. They usually begin at midday, and the first afternoon is largely taken up with briefing and being checked out aboard the yacht. The first night will therefore be spent at, or close to, the port of departure (most companies insist that yachts are anchored by 4.00 pm due to the difficulty of seeing fringing reefs when the sun is at a low angle). Charters end on the morning of the final day, so the last night out needs to be spent at an anchorage not too far from home base. So, out of a week’s charter, this leaves five nights of real freedom of choice of anchorages, making a seven-night charter the practical minimum if one is to have enough time to see something of the area without imitating a road-runner. Charter vessels come in a variety of shapes and sizes. 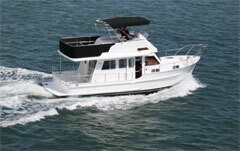 Monohulls (one hull) and Catamarans (two hulls) are available as either sailboats or motorboats. Sailboats are a fun way to experience the peace and tranquility of the area – though not as fast as motor boats, they can’t always cover as much distance in a day. Catamarans offer more space than monohulls, though some people prefer the motion of a monohull in a seaway. Ultimately the choice comes down to personal preference and budget. Most charter companies can provide detailed specifications of their available choices. The central group of islands are within easy reach of the mainland and island charter bases, and these islands offer many choices of anchorages which have appeal for different reasons; for example, some offer excellent snorkelling, some offer fishing, some have good beaches for swimming, some have resorts. Beware of being too ambitious in drawing up an itinerary. Everyone always wants to see as much of the islands as possible, but just as spending only one night in each city on a world trip can prove exhausting, going to a different anchorage every night may defeat the purpose of a truly relaxing holiday. In practice it’s nice to stay a few nights at some destinations to get into the relaxed rhythm of life aboard, doing only what’s necessary to survive and not thinking about moving on to the next port straight away. The central islands are the most popular, having the pick of the all-weather anchorages. The southern islands are less frequently visited and may appeal to those seeking greater solitude. Several of the islands have resorts, some of which welcome visitors in boats provided they register prior to arrival and pay a mooring fee. In most cases this fee gives you the keys to the resort facilities. A stopover at a resort can be a pleasant break in a cruise, making a land-fall and having a night out. The costs of a bareboat charter include the hire of the yacht, food, marine park fee, and perhaps a few extras, such as mooring fees when visiting an island resort. Charter companies offer a complete provisioning service which takes all the work and worry out of procuring food and planning meals. Several standards of provisioning, from ‘basic’ to ‘gourmet’, are available. Alternatively, charterers can do all the shopping and loading the food aboard themselves, which takes time out of the holiday, or they can provide a shopping list in advance and have the company buy to order (for which a service fee is charged). The cost of a bareboat holiday can become relatively inexpensive if the cost of hiring the boat is divided among a number of crew. For anyone who doesn’t want the responsibility of skippering a yacht on their own, crewed charter vessels operate in the Whitsundays. 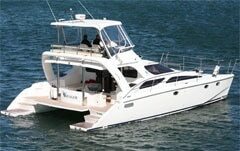 These vessels come with a licensed skipper and assistant, who run the boat and pamper their guests. Sometimes the guests wish to take over the sailing and decision making, in which case the professional skipper and assistant are usually quite willing to simply become part of the crew. For some charterers this situation offers the best of both worlds being able to skipper the boat themselves while being free of some of the restrictions (and responsibilities) under which bareboat charterers operate, such as the limited charter area (which does not include the Barrier Reef), the need to be anchored by 4.00 pm, and so on. Another variation on the theme is hiring a bareboat and arranging to have a professional skipper as well, in which case the charterer pays the normal costs of the bareboat plus the additional fee for the skipper and his/her food. Snorkelling is one of the best ways to appreciate a coral reef – in shallow water where the sunlight is bright and the colours of the reef can really be appreciated. Snorkelling requires little equipment, and one can become totally absorbed observing the wide variety of corals or watching reef creatures going about their business in their own environment. A few hours of snorkelling practice before departing on a holiday, particularly for those who are new to it or who haven’t done it for several years, will be well rewarded when the time comes, because the brush-up on basic skills will make it easier to relax in the water, which is the key to enjoyment. All that’s needed is a face mask, snorkel, and fins. Its important to have a mask that fits well, for a leaking mask is not only annoying but it interferes with relaxing. Anyone who intends doing much snorkelling should consider purchasing their own mask rather than leaving it to chance that they’ll find a good fit among those provided by a cruise operator. And, it’s wise to purchase a mask at a dive shop rather than a supermarket, for example, because dive shops stock a wider range, and they know how a mask is supposed to fit. Test the mask by holding it against the face with the index finger, making sure that all hair is away from the part that seals around the face, then breathe in gently through the nose. The mask will be sucked against the face and should stay there without being held, even when the head is shaken gently from side to side. Snorkels come in a variety of models, some with features such as adjustable mouth pieces and purge valves, which make them very comfortable to use, but basically a snorkel is just a simple tube, and the simplest model can be quite adequate. They’re not expensive, so when buying a mask, its a good idea to get the snorkel as well, and that way they will always be together in your bag, properly assembled. Fins come in three or four size ranges, and it’s usually quite easy to find a pair that fits among those provided by the cruise operator. The water in the Whitsundays is relatively warm all year round, but even so, most snorkellers wearing only a swimsuit find that 20-30 minutes is about as long as they can go without beginning to get chilled. A wetsuit with short sleeves and short pants (a ‘shorty’) may give some added comfort in the cooler months, although the minimum average temperature in mid-winter (21°C) is certainly not too cold for ordinary swimming. Enjoyable snorkelling depends on one’s being able to lie face down in the water completely relaxed, keeping the body flat on the surface and breathing easily. Being relaxed is the key to staying parallel with the bottom, which is the correct position for viewing. If the body is tense, the feet and legs have a tendency to sink, and you find yourself churning the water to stay afloat, perhaps even kicking the bottom if you’re in shallow water, which will certainly frighten away any wildlife that you might hope to see. Newcomers to snorkelling should practise in the shallow end of a swimming pool or near a beach (where it’s easy to stand up) until breathing through the snorkel feels natural. Finning is an almost straight-legged action, with knees slightly bent. Some say it helps to imagine having splints on your legs. It’s sometimes easier to get the feel of it on your back. Surface currents can be quite strong in the Whitsundays, particularly at times of spring tides. Keep an eye on the boat to see that you haven’t drifted too far away. Sunburn can be a potential hazard for snorkellers because one feels no heat, and it’s possible to get a burn on the back of the legs and upper back while absorbed in the underwater scenery. Always put on plenty of water-resistant sunscreen, or wear a T-shirt; some snorkellers wear a Lycra suit, or shirt and trousers, which gives good protection from the sun and also protection against scrapes and scratches. There are few aggressive creatures to be encountered, although some are curious about snorkellers just as snorkellers are curious about them. It’s a good idea when entering foreign territory to behave like a guest in someone else’s house. In this state of mind, interaction with the local inhabitants will almost certainly be polite and pleasant. As a general rule it’s wise to be a passive observer and not to handle the animals. Don’t splash around on the surface making a lot of noise, impersonating a wounded fish; you may send out the wrong signals. Marine creatures depend on a spectrum of low-frequency vibrations for communication, navigation, and for detecting wounded prey. The Whitsundays are perhaps most renowned for game fishing. It is Australia’s prime bill-fishing area, and during the spring and summer months game fishermen come from around the world in hopes of catching a record sailfish, or perhaps a black marlin or bluefin tuna. Over the years many light-tackle records have fallen in the Whitsundays. Amateur anglers do not require a fishing licence in Queesland, although it is unlawful to sell fish without a permit. Please be aware that there are strict marine parks zoning rules that apply to fishing in the area. See 100 Magic Miles for zoning maps. Coral reef fishing is the preoccupation of local fishermen and can be done almost anywhere among and between the islands (other than in no-fishing zones). For those inexperienced at fishing around coral, there are a few tricks that may improve one’s luck. Fishing in coral requires line of at least a 25-kilogram breaking strain, not so much because a huge fish is waiting to pull you out of the dinghy but because coral is murder on fishing gear. Always have plenty of spares on hand. Thin line will, in short order, be chewed to pieces by coral, and fish living around coral tend to take the bait and run for cover under the nearest boulder. A line attached to a fleeing fish can be quickly severed, and it may also cut the fingers, which is why many coral fishermen tape their finger joints. Keep enough tension on the line to register bites and to avoid snagging. The weight of sinker can be adjusted to suit the current. Fish over the edge of the reef one hour before or after high tide for best results (neap tides are better): early morning and evening are also better than when the sun is high. Night-time on a rising tide can be excellent. Trolling along the edge of a reef may also produce dividends. Baits readily available in the Whitsundays are prawns, squid, Western Australian pilchards, small fish known locally as ‘herring’ and garfish. If you have a throw-net, small fresh fish from the shallows make excellent bait. A few suggestions about tackle are given later. The Whitsunday mainland coast is studded with mangrove inlets that can yield good catches, and on some of the larger islands, such as Whitsunday and Hook, there are deep embayments with mangrove areas that also can reward the angler. As the tide runs out of estuaries and creeks, predator fish look for baitfish that hide around sheltering ‘snags’ or which are being flushed from streams and gutters on the flats and out into the main creek. During the last half of the runout and the first part of the rising tide these areas can be a good place to drop a lure or a live bait. Some of the bigger fish hang around the deeper holes and channels. Cluster of Four: as the name implies, four medium-sized stones in close proximity have created some excellent terrain for exploring – deep canyons and narrow crevices full of whip corals and large fish life. Some current on outside. The Lost Stone: at the northern end of the chain, the stones seem to disappear but are actually just deeper, rising to within 5 metres of the surface. Very good fish life, medium- to large-sized. Fairly deep dive, 8-30 metres. Current at mid-tide. The Whitsundays are a renowned game-fishing area, particularly for billfish. Game-fishing charter boats operate from the mainland and from several of the islands. In the winter months, the Whitsunday’s experience big runs of Spanish mackerel -beginning mid to late May and running until late September or early October, although mackerel can caught any time of year. In summer, the Whitsundays are a prime billfish area – black marlin, swordfish, sailfish – and tuna are caught in large numbers from October through April, although the latter may also be caught year round. Tournaments are held throughout the year for a number of different species, with major meetings in November and December in quest of billfish. Game fishing takes place around the islands and out at the Barrier Reef (weather permitting). Mackerel can be caught anywhere, but the best locations are the outlying islands from Deloraine, the Edward Group, Minstrel Rocks, around past Pinnacle Point at the top of Hook Island to Dolphin Point, Hayman Island. ‘The Paddock’, which is the open water just north-east of Hayman and Hook islands, yields some magnificent game fish. Tuna can be caught right amongst the islands. Experienced anglers look for birds diving on the water, a sure sign in season that there are tuna. One tactic employed for hooking tuna is to run just upwind of the feeding school and cast across and through the school with a spinning outfit, such as a small chrome spinner with treble hooks hanging off the back. This tactic avoids ‘spooking’ the fish, which sometimes happens when trolling around tuna. Run upwind, which will facilitate casting, and shut down the motor: in this way its possible to get within 6-10 metres. Bilifish are found in the shipping channel, between the islands and the Great Barrier Reef, in deep water where there are lots of bait fish in the summer months. Marlin range in size from 10 to 125 kilograms, the average being 30 to 50 kilograms. The great majority of billfish caught in the Whitsundays are tagged and released. A rod may have its advantages when fishing from rocks on the mainland, but hand lines are easier to manage on a boat A large diameter casting reel makes hand-line management much easier. The illustration represents the most popular rigs with local fishermen. A, B and C may all be used for reef or estuary fishing, for bottom fishing over sand, mud, near bommies or around reefs. A and B are preferred in reef fishing as they are light: the important basic principle in all rigs is to use the minimum amount of wire trace, the smallest number of swivels and the lightest possible sinker. Too much hardware makes it difficult to register bites and increases the risk of the line being snagged on coral or some other obstruction. Running sinkers (through which the line can easily pass) help timid fish to go with the bait without having to drag a weight that might otherwise deter them. Some fishermen prefer beanshaped sinkers instead of ball sinkers as the bean keeps the line in place more effectively. Rig A is good over sand or mud, as some movement helps to attract fish such as flathead. Rig C is sometimes called a snapper rig and is used in deep channels. The sinker may weigh as much as 225 grams. Rig D, the ‘floater’, is simply a gang of hooks (the size to be determined by the quarry sought) generally used to catch surface swimming fish such as mackerel. Garfish is popular bait for mackerel, usually on a piece of wire 30-35 centimetres long with two or three ganged hooks run into the belly of the bait. In front of this some of the professionals use a coloured plastic squid (any bright colour will do), about 12 centimetres long, with a barrel sinker in the front end to keep it underwater when trolling at 5 knots or so. When trolling with a rig other than a rod, its a good idea to have some shock absorber in the line, perhaps a bit of bicycle tube or a shock cord tied between the line and where it is secured. Fishing is prohibited in Marine National Park zones (green areas). In Conservation Park zones (yellow), fishing is permitted with the use of only one hook on one hand-held line or rod (per person); no set lines are permitted. Trolling for pelagic fishes is allowed. Limited spearfishing is allowed in the General Use (light blue), Habitat Protection (dark blue) and Conservation Park (yellow) Zones and means fishing with a spear or speargun not using a powerhead, a firearm, a light, or underwater breathing apparatus other than a snorkel. It. Spearfishing in yellow zones that lie within Public Appreciation Areas is not permitted (see 100 Magic Miles pages 112–113 for zoning information). Public Appreciation Areas are shown as broken pink lines on the zoning map. A person must not have a loaded speargun in his or her possession out of the water. Brampton and Carlisle Islands: waters between the islands. Lindeman Island: the western and southern sides. Long Island: the western side. South Molle Island: the northern side. West Molle Island (Daydream Island): surrounding waters. Hook Island: the eastern, south eastern and southern sides. The Queensland Government has announced the Coral reef fin fish closed season dates for the next five years which will provide certainty and long-term planning for fishers. Dates in advance assist fishers in their planning. The closure dates coincide with the new moon when key coral reef fish species aggregate to spawn. The dates have been scientifically reviewed, and October and November have been found to be the months of highest effectiveness for closures to protect coral reef fin fish. Closed seasons are vital to allow stocks to replenish to ensure there are healthy fish stocks for current and future generations of Queensland fishers. The closures apply to coral reef fin fish only, so fishers can still enjoy fishing for a wide range of other fish during the closure period. The closures will be in place from the northern tip of Cape York to Bundaberg in the south (the southern boundary is at latitude 24º 50’S). The eastern boundary of the closure is the same as the eastern boundary of the Great Barrier Reef Marine Park. The purpose of minimum size limits is to protect fish until they grow to maturity and can have at least one spawning cycle. Maximum size limits have been introduced to protect large groper and cod. Any fish falling outside the size limits must be released. Bag limits help to conserve heavily exploited species and spread the catch more equitably among fishers. Anglers are not supposed to mutilate any fish so that the fish inspector can’t determine what’s been caught. If fish are filleted, skin must be left on. Fisheries inspectors make regular checks of vessels, and the penalties are quite heavy for possession of undersized or too many fish. Oysters may be taken only for immediate consumption on the spot in most of the Whitsundays, except in the totally protected Marine National Park zones where they may not be taken at all. Under Queensland fisheries legislation you may not collect oysters in a container to eat later. The best way to identify fish caught in the Whitsundays is to ask a local fisherman. Some assistance may also be found in two very good books on fishes of Queensland and the Barrier Reef region, Guide to Fishes, by E.M. Grant, and Fishes of the Great Barrier Reef and Coral Sea, by J. Randall, G. Allen and R. Steene. It’s a good idea to check locally to see that others have not been put on the list temporarily (fish can become temporarily ciguatoxic in a particular locality). Generally, larger fishes are more likely to be ciguatoxic. Avoid eating any fish larger than 4 kilograms, and don’t eat repeated meals from the same large fish. Puffer fishes are inherently poisonous and should never be eaten.